The Israeli Olympic Sports Research Center aims to encourage studies that will enhance Olympic sports in Israel in line with US and European models. The joint research activity has already begun. The center’s first research goal is related to windsurfing. Gur Steinberg, who coaches the Israeli windsurfing team, and Yair Talmon, Scientific and Technical Coordinator of the competitive sports unit, targeted as their first goal to research surfer/ surfboard compatibility in order to provide the athlete with best performance ability. Steinberg explained that a certain surfboard model can have various types of fins and this can make a difference in the athlete’s performance. This difference requires each surfer to examine and test the selected fin over time, but this takes much effort and sometimes even causes the fins to break. Steinberg and Talmon’s initiative led to a Technion study named, ‘The Mechanical Signature of Olympic Surfboard Fins,’ which makes it possible to differentiate accurately among the various fins and adapt them optimally to the surfer. The research was conducted at Technion’s Material Mechanics Center Faculty of Mechanical Engineering, headed by Prof. Daniel Rittel, and with the scientific support of Prof. Nitai Drimer and Prof. Alon Wolf who is also the Head of the Laboratory for Bio-Robotics and Biomechanics. Prof Wolf’s research encompasses many areas, including robots used for surgery, rehabilitation and rescue and recovery missions; the study of the mechanics of the body; and the development of technologies to improve the motor function of healthy and sick people. “Very often we see that a fraction of a second or a few centimeters determine whether a competitor will win a gold medal. This kind of advantage is the result of scientific understanding and its implementation in training and equipment. 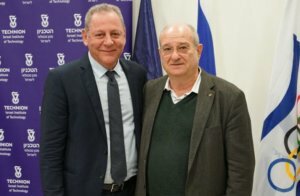 We believe that if we implement the knowledge and capabilities that have made Israel the Start-Up Nation that it is today, into Olympic sports, we will be able to advance the achievements of our Olympic athletes and help them become role models whose achievements will infiltrate into Israel’s sports culture,” Prof. Wolf said. The Olympic Committee in Israel is an umbrella organization for Israeli sports, one that brings together all the Olympic branches and represents Israel in the International Olympic Committee. Its main function is to ensure the optimal preparation of the athletes in Israel’s delegations to the Olympic Games and other competitions. 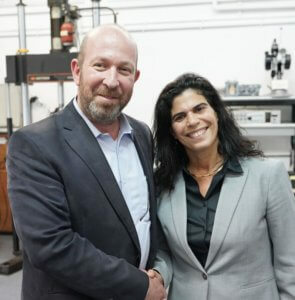 The new agreement was signed by the Olympic Committee in Israel, the Technion and the Technion Institute for Research and Development. 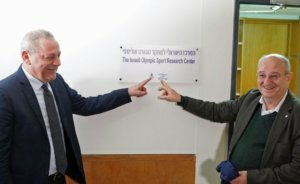 The strategic agreement for the establishment of the new Israeli Olympic Sports Research Center was initiated following a seminar held at the Technion for Olympic sports coaches and in recognition of the need for extensive and in-depth research on various aspects of sports. On behalf of the Olympic Committee of Israel, were: Chairman, Yigal Carmi; Director-General, Gili Lustig; Committee Board Member and Sports Committee Chairman, Yael Arad; Scientific Director and physiologist, Muli Epstein and European Championship silver medalist, Yoav Omer. Technion representatives included President, Prof. Peretz Lavie; Technion Vice President for Research, Prof. Wayne D. Kaplan; Technion Vice President for External Relations and Resource Development, Prof. Boaz Golany; Dean of the Faculty of Mechanical Engineering Prof. Yoram Halevi and Prof. Alon Wolf. Original article posted on The Technion’s website.